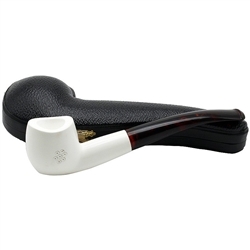 Hand Carved Smooth Freeform Meerschaum Pipe - There are decorate touches of lattice carving on the sides of the pipe bowl on this free form pipe. On the bottom of the bowl up the shank the carver made a flat panel to allow the pipe to sit up straight. The stem is a dark translucent color and makes a nice contrast to the white color of the meerschaum.